STUDIO SCORECARD. 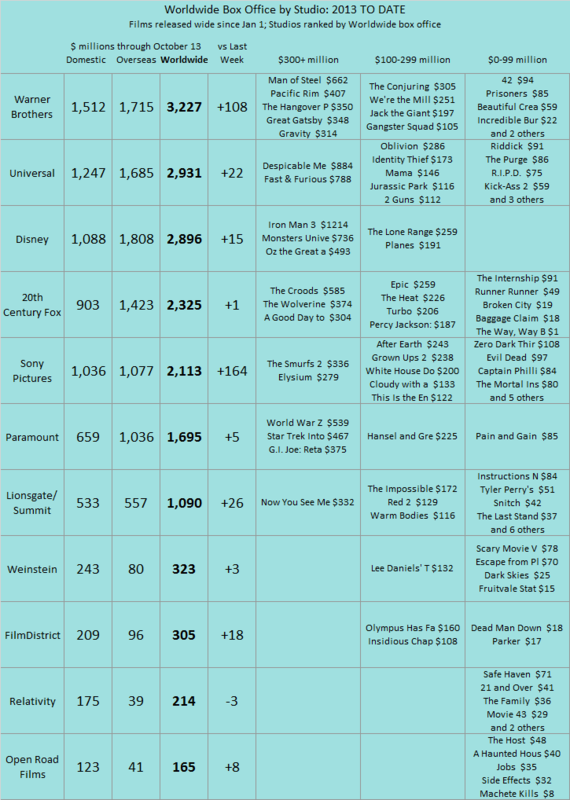 In the worldwide studio rankings for 2013 to date, Warner Brothers again distanced itself from the others as Gravity enjoyed an upgraded domestic final and the start of overseas dollars, which will soon turn into a gusher. Sony also had a good week as Captain Phillips came aboard and overseas results from other films continued to come in, but the high-volume/ low-hit studio remains down in 5th place overall. The other studios were generally very quiet this past week. Over the past six weeks, 2013 is now 1% above the same six weeks in 2012 and 2% above the four-year average in the same time frame ($0.735 billion).